1. The FME series is originally designed for European wireless market and used for mobile antenna application. 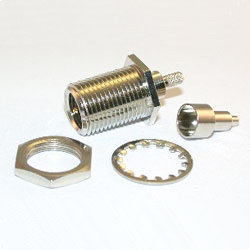 It is a miniature screw coupling coaxial that has a 50 ohm impedance. 2. The offer excellent electrical performance from DC to 3.0 GHz. FME Str. Jack Bulkhead Crimp Type. Suitable cable: (1) RG58. (2) RG174, RG186, RG316. 2. Impedance: 50 Ohm. 3. Frequency range: 0-3 GHz. 4. Working voltage: 500 VRMS Max. 5. Dielectric withstanding voltage: 1000 VRMS 6. VSWR: (1) Straight: 1.30 max. (2) Right angle: 1.50 max. 7. Contact resistance: (1) Center contact: 10 milliohm max. (2) Outer contact: 5 milliohm max. 8. Insulator resistance: 5000 Mega ohms min.